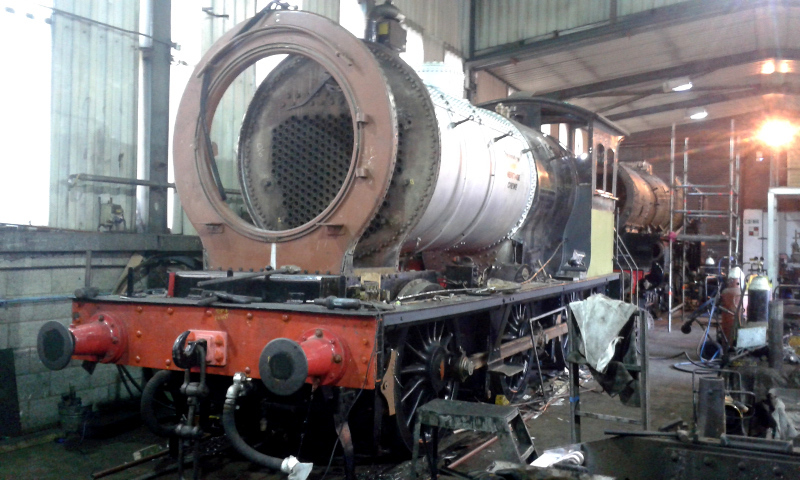 Not much progress was possible on the locomotive last week because of the bad weather, although, as previously reported, we managed to get the final bits of the J27 down to Grosmont by the end of the week, thanks to the efforts of all concerned, and an easing of the impact of the 'Beast from the East'. Since then however, there has been considerable activity. 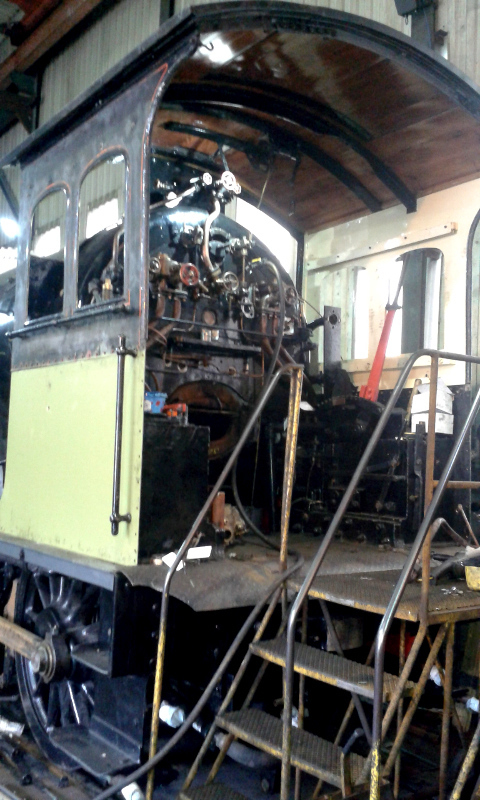 Phil Naylor has finished de-rivetting the old smokebox wrapper and started preparing the smokebox for fitting the new one. The smokebox door front plate has been re-erected (see photo taken on Wednesday) and squared off ready to receive the new wrapper which was delivered from Teesside on Wednesday afternoon. It is in two halves for ease of fitting, and that is expected to start next week. The top part of the cab has been secured and work is progressing on fitting the cab pipework (see photo taken on Wednesday). Subject to that, John Furness hopes to paint the cab next week. For the rest of the locomotive, he has asked for 5 clear days once all the work has been finished, to complete the painting. The tender was due to be filled with coal and water and weighed by the end of this week. The postponed hydraulic test was also successfully carried out yesterday (Thursday 8th) in the presence of the boiler inspector, so the ticket has now restarted and we have therefore regained the time lost since the previous hydraulic at Crewe and its time at Hopetown. Back at Hopetown, Derek Norris has been working on replacing the glass in one of the cab sliding windows, and Roy Marshall is pursuing the supply of a new storm sheet. Further progress report next week, but bear in mind that jobs are being carried out not necessarily in the strict order set out in the project plan I circulated on 20 February, but as practicalities and resources dictate. 8 April remains the target completion date, but the impact of the recent bad weather has still to be assessed. However, we are in discussion with the NYMR about possible events for Hopetown volunteers at Grosmont with the J27 during the planned running in period in April - watch this space.